This week: Your baby's legs are finally longer than his/her arms. And all four limbs have joints that are fully functioning now. Your baby is squirming and wiggling like crazy in there, although you probably still cannot feel his/her movements. By this time, your baby may have developed the habit of sucking his/her thumb and their scalp hair pattern is developing as we speak. Their skin is very thin and you can clearly see their blood vessels underneath. As of now, your baby's heart is pumping 25 quarts of blood each day (which will increase to 300 at term). I cannot believe how much changes every week with our little munchkin. It's so exciting to read what's going on and how the baby is developing. I can't wait until next Monday, which is our next appointment. 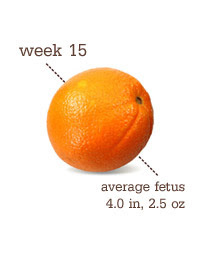 We won't have an ultrasound, but I'm still looking forward to hearing what the Dr. thinks about the baby's development.